Today, we are going to have another dual-boot tutorial, which will teach you how to install the latest version of Xubuntu 14.04 Trusty Tahr alongside Windows 7 in a happy tandem configuration. I have already shown you how to achieve this kind of setup with both Windows 7 and Windows 8, using mainstream releases of Ubuntu. 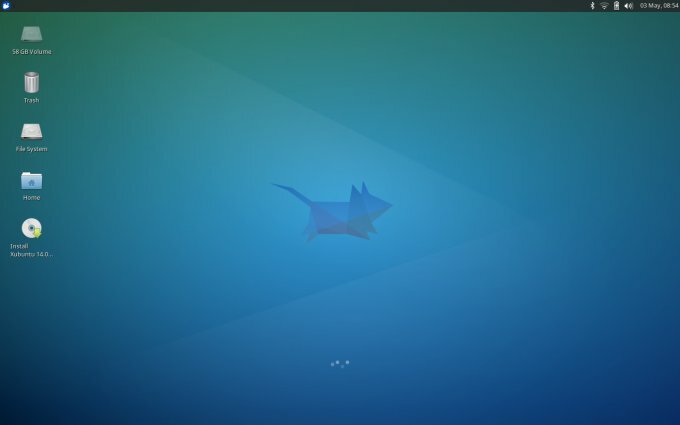 Now, we will diverge and test with Xubuntu, the Xfce-powered edition, which definitely merits use and fun. Most of the stuff will be very similar to what you have seen before. Still, for the sake of completeness of this exercise, I will go through all the necessary steps, slowly and carefully, so that you have additional confidence in trying to do the same thing yourself. Please, follow me. I am not going to repeat myself ad nauseam. There is a lot you should read and learn before attempting to dual boot. Therefore, please consult these four guides listed below, and all the other relevant material linked in each one of the articles. That's your starting point, and from here on, I will assume you have done your homework. 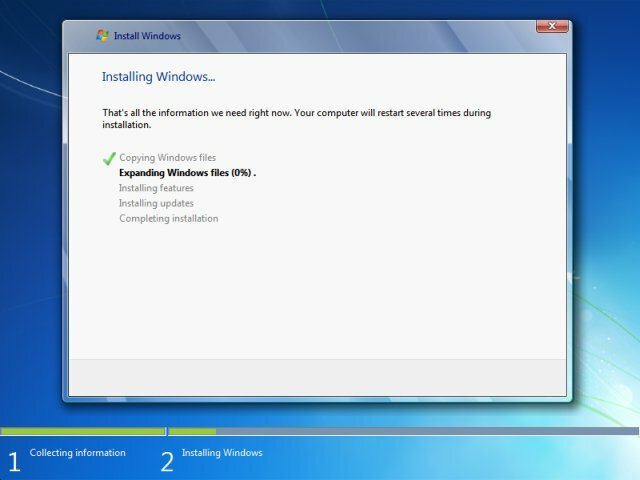 How to install Windows 7 - If you are performing your own installation setup rather than using a preinstalled host, then you will want to invest time in checking this tutorial. It highlights the important steps in how to prepare your hard disks, so that your Windows installations are flexible and friendly for dual booting. 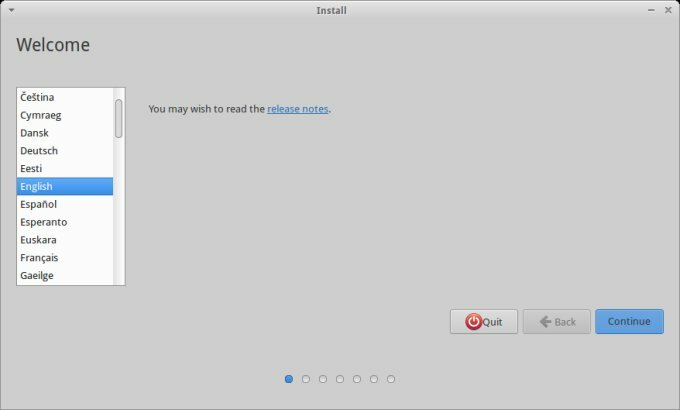 How to install Ubuntu - This is a very detailed guide on how to install Trusty, and it is going to be virtually identical to what we will attempt today. Once again, it comes with numerous examples on dual and multi-booting, so it should be extremely valuable. 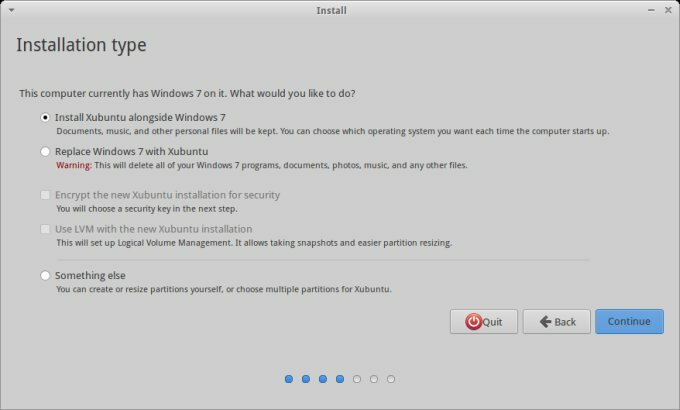 How to setup Ubuntu & Windows 7 side by side - This guide has originally been written for a much older version of Ubuntu, Karmic Koala in fact. Does it matter? No. The stuff in the guide remains 100% relevant and accurate. So please take a look. How to setup Ubuntu & Windows 8 side by side - This guide tells you all about configuring Windows 8 and Linux in a dual-boot configuration. The clever part is that the procedure is done on a preinstalled, touch-enabled Ultrabook, which comes with a rather complex GPT partition scheme including hidden and recovery partitions, UEFI and Secure Boot. All right, so what are we going to do today? My test box for today is Lenovo T400 laptop, which comes with two cores, 4GB RAM and 80GB SSD. Windows 7 is already installed on the disk, but there's some free space left at the end of it, so to speak. 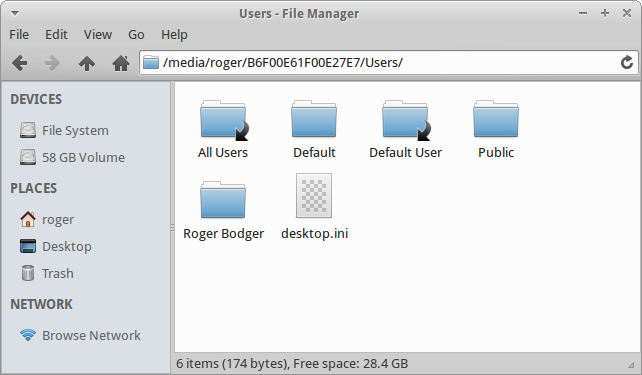 We will setup Xubuntu in this free space, without any great changes to the disk layout. In a sense, the exercise will be much simpler than what we have done with the Asus VivoBook, where we configured Windows 8.1 and Trusty. However, it shows yet another usage model we have not seen before. 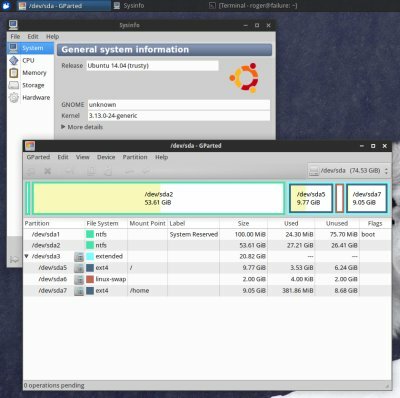 We had the replacement of installed systems, as shown in the Ubuntu guide, we had the shrinking and resizing of partitions, true for both the earlier Windows 7 guide and the latest dual-boot guide, but we have never tried the almost straightforward case of free space. So that's our mission. If you have Windows preinstalled, you don't need to do anything here. If you don't, then install the operating system, following the nice tips I've laid out earlier. This will make you a happy user, and your disk management will be so much simpler. In our example, Windows is preinstalled, so to speak, even though it was installed a few years back by your significant author here, with a smart disk layout created in advance. Reaping the benefits of early preparations. We do the same thing we did with Ubuntu. Download the image, burn it to DVD or write it to a USB drive. Configure your laptop to boot from an external device or DVD first, let the Xubuntu live session load. Configure your Wireless connection, and play around a little until you are fully satisfied that you have the right hardware compatibility. Let's examine the disk layout BEFORE we fire up the installer. 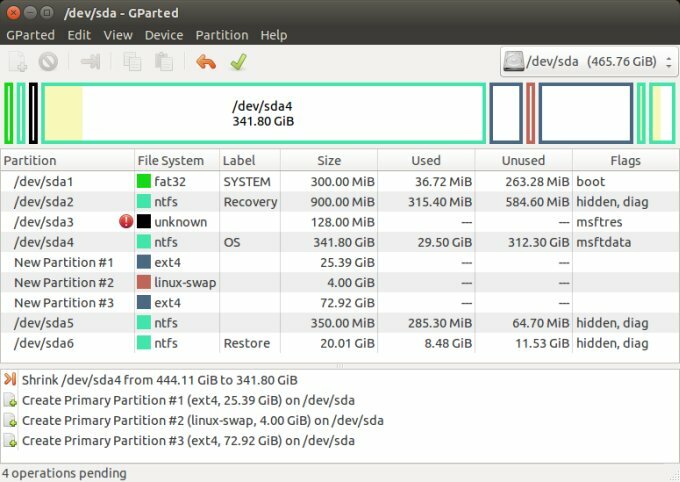 Remember, always use a dedicated partition tool to setup partitions. Do not use the installer wizards. Our tool of the trade is GParted, a trusted friend. A trusted friend for a Trusty installation, oh that's punny. And funny. In Xubuntu, you may not find GParted in the menu, even though it is installed. In the best case, you will see Run gparted line. And if you attempt to start the software this way, you will fail, because it requires root permissions. Open a terminal window and start GParted either by typing sudo gparted, or starting a root shell with sudo su - and then gparted. Note: It is located in the system settings, but still. So what do we have here? We have two primary partitions on the disk. One, /dev/sda1 is the 100MB system Reserved partition created by Windows 7. Two, /dev/sda2 is a 50GB primary partition that corresponds to Windows drive C:, and it contains all the data. We also have 21GB unallocated space. 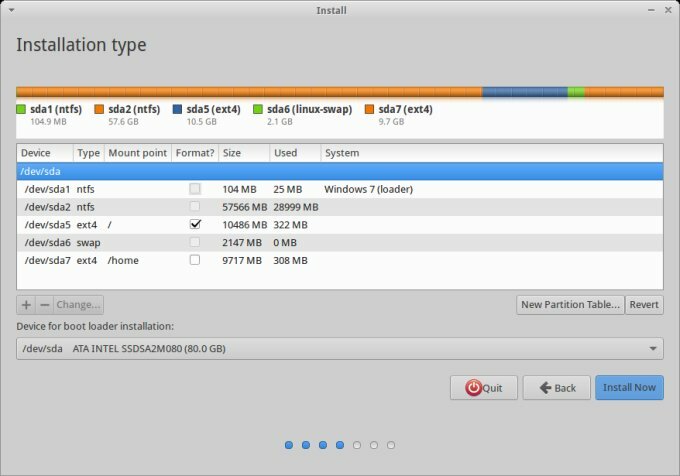 Now, we need to create some partitions for our Linux installation. We want three partitions, as usual. We want a root (/) partition, a separate home (/home), and we also want swap. All right, let's create them. Again, as we have done this before in many other tutorials. Right-click on the unallocated space line, choose New. We will create an Extended partition to span the entire free space. Inside it, we will create a logical partition, ext4, 10GB in size as the root (/). We will also create a logical 2GB partition for swap. And finally, allocate the remaining space to home (/home). Once you are ready, apply the changes and let them complete successfully. Now, you can exit GParted and start the installation. Start the installer. All the steps are identical to Ubuntu. But still, let's make sure we do not make any mistakes. Let's focus on the critical parts, namely disk management once again. The rest, I will leave up to you. 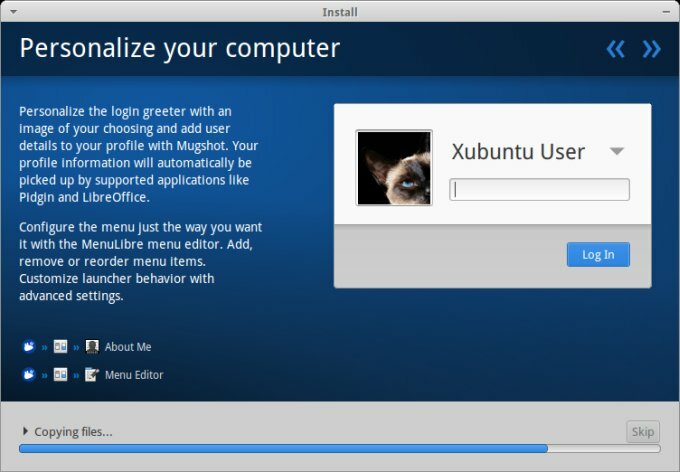 Under Installation Type, Xubuntu will suggest installing itself alongside Windows 7. Good as an idea, for those who want the dual booting to be attempted magically, but this means another new layout, because the installer is not as smart as, say openSUSE to figure out how to use the three new partitions we just created. Therefore, we will select the last option, which reads Something else. Now, we have our partitions. Let's assign them the right mount points and filesystems. Highlight each, hit Change and make the right decisions. We've done this many times before, so please consult the Ubuntu 14.04 guide for more details. All right, so we have /dev/sda5 as root (/), we have /dev/sda6 as swap, and /dev/sda7 as our home (/home). You can reformat the partitions if you will, but we have just done that, so there's no great need. For the fun effect, I am going to reformat the root partition, but not the home partition. Indeed, if you are reinstalling, you want to be careful there. The last thing to pay attention to is the bootloader installation. Of course, you will have to consult my GRUB2 tutorial for more details, on what exactly bootloaders are, how they work and what needs to be done. In a nutshell though, when you're making a dual-boot configuration, only one operating system can be in charge of the bootloader, and the other will be called through it. Windows 7 cannot easily boot Linux systems. Therefore you need to allow Xubuntu to be in charge of the boot sequence. This means that the bootloader needs to be installed into the first sector of your hard disk device. In this case, /dev/sda. Let the installer finish, enjoy the slideshow. After the installation completes, reboot. If you have done everything correctly, the bootloader is also properly configured. You will see the GRUB2 menu, and you can select the desired entry. Let's begin with Xubuntu. Looks good. We have our 10GB root, 2GB swap and 9GB home. Windows sees them all as primary partitions, but this is not correct, and not really important. The two NTFS partitions are there, as we have left them, healthy and untouched. Everything works mighty dandily. Congratulations, another dual boot setup done with success! One more mystery unveiled, one more dreadful tutorial completed with success. After you've done a few hundred of these, it sort of becomes trivial. And with some luck, my guides will have helped you shed the trepidation. Of course, it all has to be done smartly. Proper disk management, and in advance, is the golden rule of the whole thing. Data backup so you're all relaxed. Good understanding of basic concepts. Xubuntu is very much similar to Ubuntu, and Windows installation are virtually all identical. So we're pretty covered there. The last unknown element in this tutorial was the new setup layout, which we have not encountered earlier, so to speak. SSD, well, there's no great magic there. And now, I believe everything is clear, and you can begin your dual-boot adventure. P.S. If you truly find this article useful, please consider supporting Dedoimedo.